It is fascinating to me that some of the L.A. artists of the 1960s working with ideas about perception in simple and reductive ways, continue to make art that grows and changes in depth and complexity. 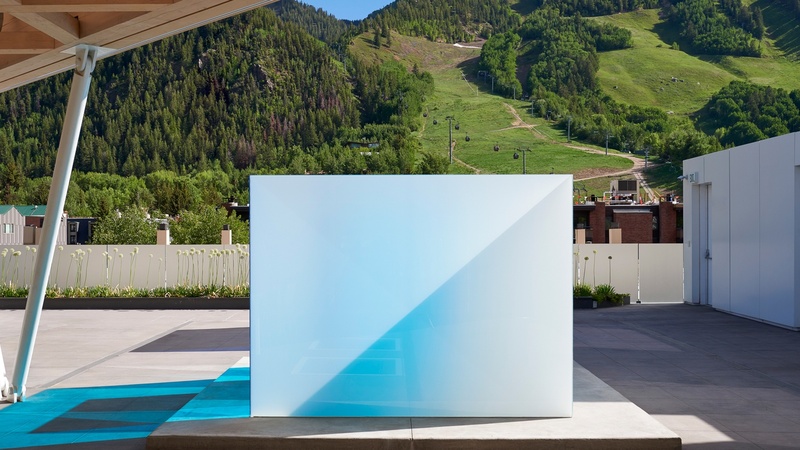 While giving a talk at Aspen’s Anderson Ranch earlier this week, I had a chance to visit Larry Bell’s new roof deck sculpture Aspen Blues. It is an ideal example of an artist operating at his peak amidst the actual peaks of the mountains in the distance. Now 78 and living in Taos, the artist is known for his glass cubes with iridescent coatings that are both transparent and reflective. His latest sculptures are made with sheets of glass layered over sheets of thin color so they can be opaque or pellucid. 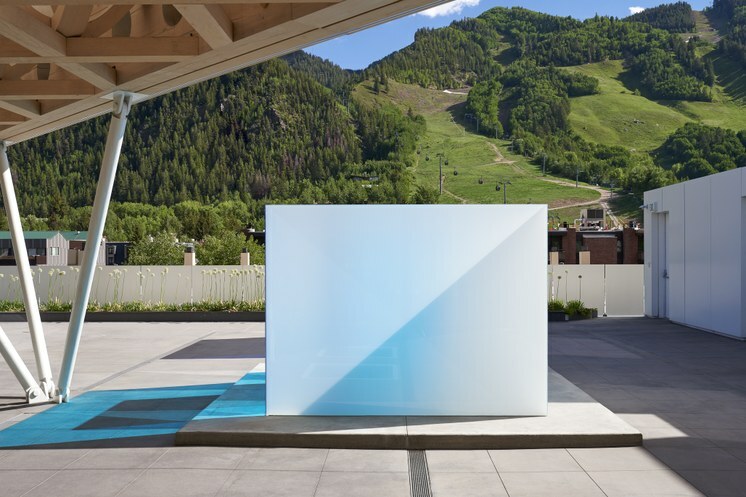 I had a chance to visit the Aspen Art Museum and see Larry Bell’s new roof deck sculpture, Aspen Blues. Aspen Blues (2018) consists of two huge boxes within boxes. Eight- foot-tall exterior sheets of cobalt or aqua refer to the ever changing color of the Colorado skies. 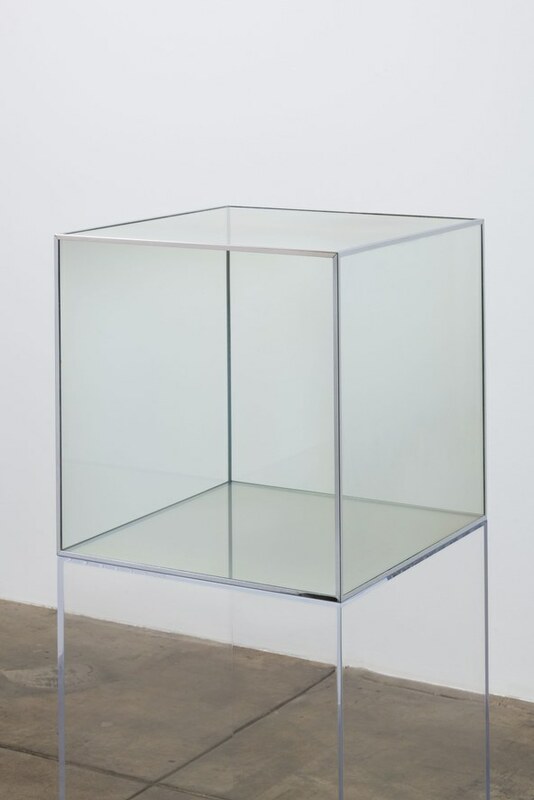 Their transparency reveals a single-six-foot tall glass box contained within each. Other exterior sheets of glass are cloudy white so the hard edges of the sculpture are defined and shadows alternate with reflections. The Shigeru Ban-designed, Aspen Art Museum and surrounding natural beauty offer an ideal context. They are only on view to December 16 but it is hard to imagine them in a better home. 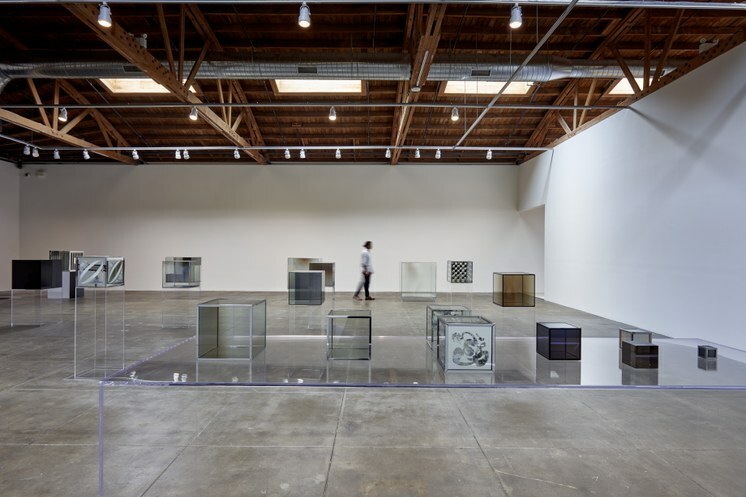 The timing is providential since a few weeks ago, Hauser & Wirth in downtown L.A. opened The Complete Cubes, which is exactly that: a survey including one example of every kind of glass cube made by the artist since 1960 when he emerged as a wunderkind of Southern California’s Light and Space movement. From the outset, the artist integrated inspiration from the atmosphere of Southern California with the rigor of Minimalist sculpture. In this show, you can see the artist’s technical ability and curiosity expanding exponentially. 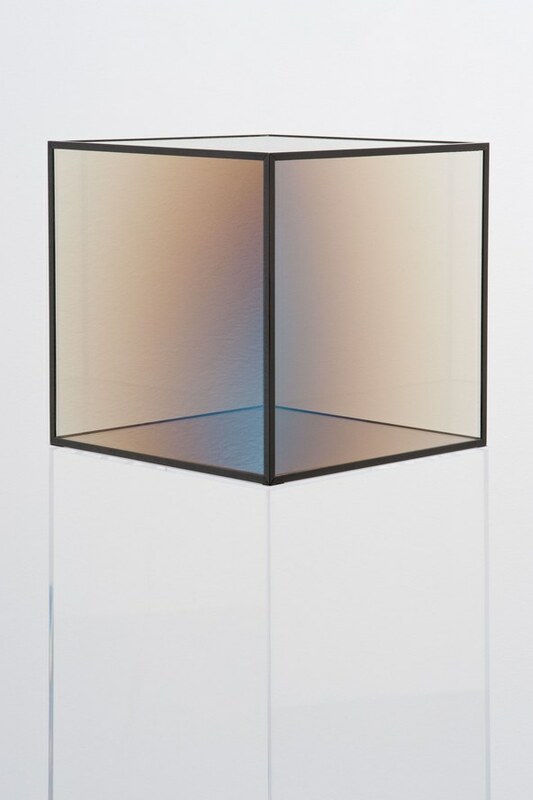 After attending Chouinard, where he was encouraged by Robert Irwin, Bell began by using pieces of mirror to construct small boxes that could reflect their surroundings. 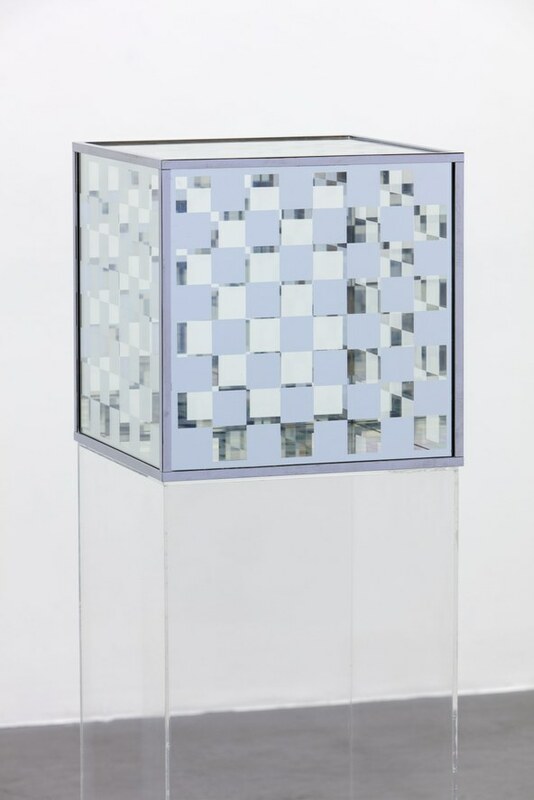 After discovering a process of vacuum-coating that gave the squares of glass a smoky glimmering sheen of indeterminate color, his cubic sculptures could been seen into and through but also claimed a distinct physicality. This is the first survey to document this unwavering but never uninteresting examination of the properties of light and space. 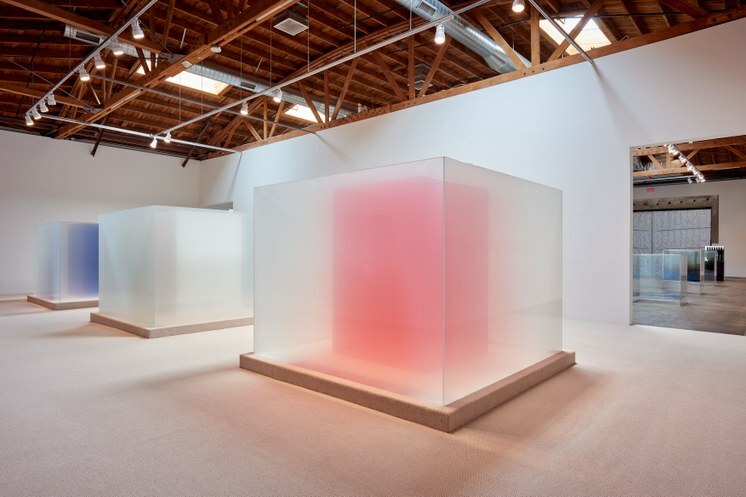 Larry Bell RWB in Venice Fog 2018 True Sea Salt, Lapis, Red Poppy and Optimum White laminated glass Courtesy the artist and Hauser & Wirth © Larry Bell Photo: Mario de Lopez. 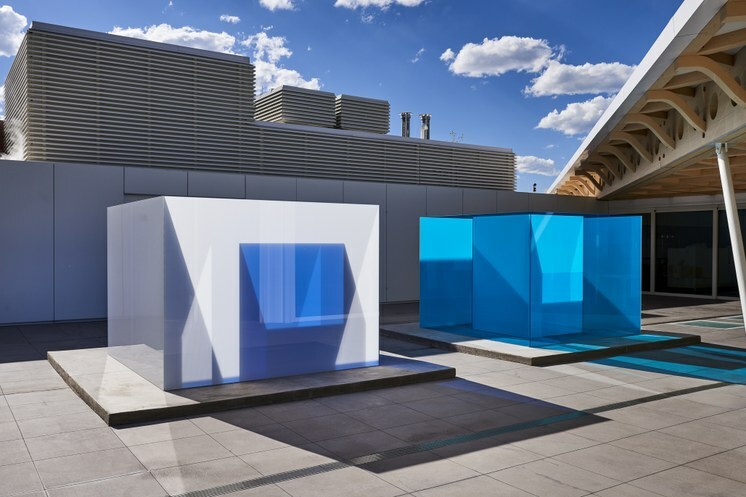 It culminates in a 2018 piece consisting of a trio of foggy white glass boxes with interior boxes of red, white and blue. Though Bell’s work has been shown consistently in L.A., it has never been shown with such precision and subtle drama.